There are many reasons why we see a lot of celebrities rockin’ the ombré hair color trend. It is a fantastic way to lighten up your hair without committing to an all over, lighter hair color or doing full highlights. Wavy and curly hairstyles work best with the ombré hair color trend and most people have a wave or curl to their un-styled, natural hair. 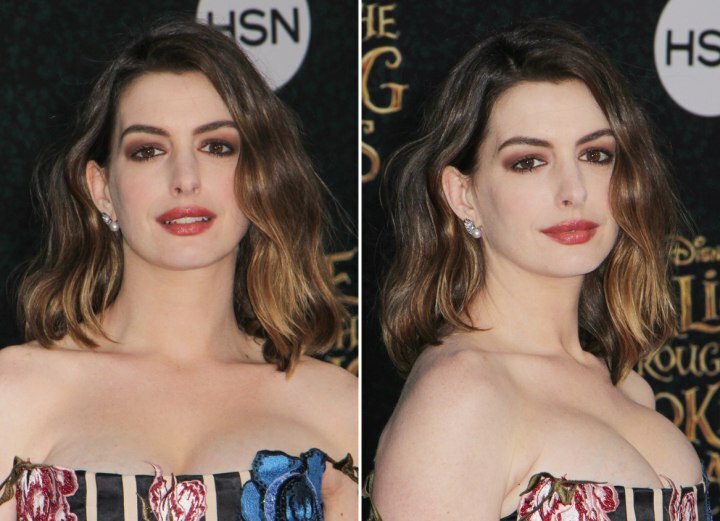 So, celebrities, moguls, moms and busy women around the world have embraced the ombré hair color trend because they can use minimal heat tools for styling and still look awesome, like Anne Hathaway, seen here on May 23rd at the “Alice Through the Looking Glass” premiere in Los Angeles (2016). Anne’s ombré long bob hairstyle is beautifully executed both in style and hair color. She is usually a dark brunette and she keeps true to that in the roots but the ombré allows her to go much lighter near the ends. While her wavy bob hairstyle looks fabulous, it didn’t require much to style it. That’s because bob haircuts are light weight and create wavy locks in most women, Anne included. She is all about minimalistic hair styling.